If you want to use Scrum to develop innovative products and services that delight your customers, Essential Scrum is the complete, single-source reference you’ve been searching for. Leading Scrum coach and trainer Kenny Rubin illuminates the values, principles, and practices of Scrum, and describes flexible, proven approaches that can help you implement it far more effectively. Whether you are new to Scrum or years into your use, this book will introduce, clarify, and deepen your Scrum knowledge at the team, product, and portfolio levels. Drawing from Rubin’s experience helping hundreds of organizations succeed with Scrum, this book provides easy-to-digest descriptions enhanced by more than two hundred illustrations based on an entirely new visual icon language for describing Scrum’s roles, artifacts, and activities. Essential Scrum will provide every team member, manager, and executive with a common understanding of Scrum, a shared vocabulary they can use in applying it, and practical knowledge for deriving maximum value from it. 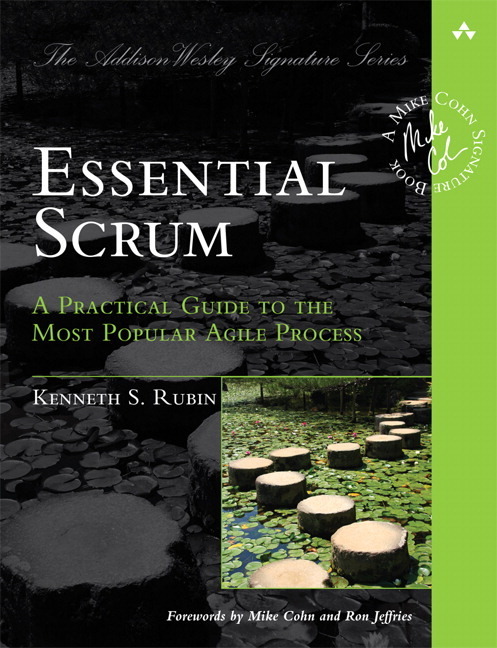 Kenneth S. Rubin provides Scrum and Agile training and coaching to help companies develop products more effectively and economically. A Certified Scrum Trainer, he has trained more than eighteen thousand people on Agile and Scrum, Smalltalk development, managing object-oriented projects, and transition management. He has coached hundreds of companies, ranging from startups to the Fortune 10. Rubin was the first Managing Director of the worldwide Scrum Alliance, a nonprofit organization focused on successful Scrum adoption. His diverse development roles have included successful stints as Scrum product owner, ScrumMaster, and developer. Rubin’s executive management roles have included CEO, COO, VP of Engineering, VP of Product Management, and VP of Professional Services. He is the author of Succeeding with Objects (Addison-Wesley, 1995). –Sameer S. Bendre CSM, PMP, Senior Consultant, 3i Infotech Inc.